Welcome to Hanky Panky in Pigeon Forge! 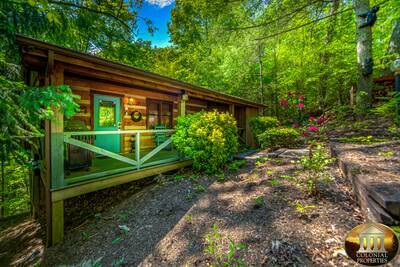 This fascinating 2 bedroom, 2 bath Smoky Mountain cabin rental is the ideal place to spend your next vacation getaway. Conveniently located near all of the action of downtown, you and your guests will enjoy quick easy access to all of the attractions, shopping, dining and entertainment options of the Smokies. The spectacular open floor plan immediately greets you and your guests with stunning natural wood accents and a breathtaking cathedral ceiling with exposed beams overhead. This luxurious living room features a mountain stone accented fireplace, flat screen TV, leather furnishings and access to the wonderful covered deck. Adjoining the living area is the amazing fully equipped kitchen that is stocked with all the necessary utensils to prepare, cook and serve your favorite meals while on vacation in Pigeon Forge. There’s also a dining table that comfortably accommodates up to 6 people. The main level master suite is truly a breath of fresh air. This romantic, cozy and spacious bedroom features a king size bed, flat screen TV and a soothing in-room jetted tub. There is also an attached full bath for added privacy and convenience. The additional second king suite bedroom is located on the main level as well and offers a flat screen TV, private full bath access and super cozy furnishings. Venture upstairs at Hanky Panky and step into the entertaining game room loft. Here you can challenge your family and friends to an exciting game of pool, play your favorite games on the upright arcade machine or just kick back and relax on the leather sofas while watching TV. The breathtaking game room will have you and your guests laughing, smiling and sharing special times for hours on end! 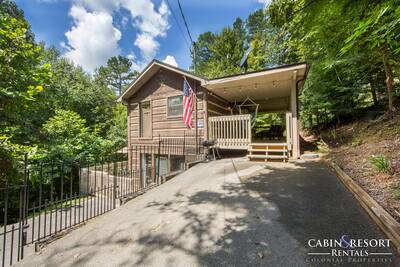 If you’re excited about spending a little time outdoors while vacationing in the Smoky Mountains, then you’ll love the wrap around deck this Pigeon Forge cabin rental has to offer. With rocking chairs and a relaxing porch swing, you’ll be able to enjoy the beautiful mountain view while being surrounded by total comfort and luxury. When it’s time to call it a day after exploring the wonders of the Smokies, jump into the bubbling outdoor hot tub and leave all of your care and worries behind. Just in case you need to do a little work or want to browse the web while on vacation, this cabin offers complimentary high speed internet access. Be sure to pack along your bathing suit when staying at Hanky Panky! You and your guests can enjoy year round swimming in the nearby indoor resort swimming pool or in the warmer months, you can take a dip in the outdoor pool as well. If that’s not enough to keep you entertained, then head over to the on-site 9 hole mini-golf course with your friends and family. 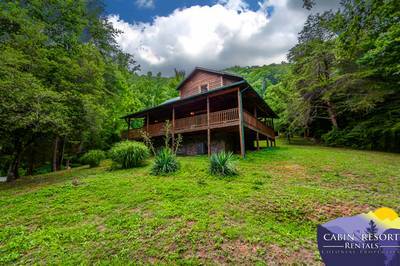 This wonderful Smoky Mountain cabin rental is truly a special place to experience all that Pigeon Forge has to offer. With fantastic amenities, luxury decor and stunning features, you and your guests will feel right at home while staying at Hanky Panky. Leave all your worries behind and reserve your stay today! A: The resort does not have fishing access. A: We do have several pet friendly properties, but not all of them are. A: Yes, WiFi is provided. “ You made our vacation even better than previous trips. The cabin was beautiful and the view was awesome. We got to see snow! Being from Florida, that was a big deal to us!!! We'll definitely book with you again!!! “ Bear Crossing resort is a lovely resort with a pool and mini golf course. The deck was nice with rocking chairs and hot tub. The beds were big and comfy. The rec loft was more than I expected, with a couple of tables and sofa. We got this unit at a great rate. 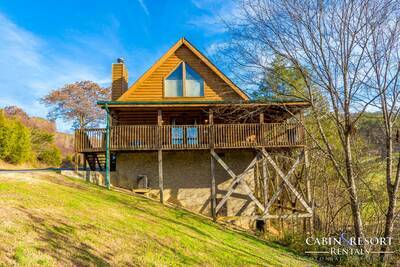 “ The cabin was great and the location was perfect! We will be back in the future. “ Love the location! Will definitely be back to Hanky Panky again. “ The cabin was wonderful. The pictures gave the impression that the rooms were larger, but the cabin was perfect for our group. We took 5 adults and one was physically challenged. The cabin was accommodating for our needs. The game room in the loft got a lot of use from our husbands and was a nice amenity. Our only complaint was that we had to leave so early. I would definitely stay at this cabin again and refer it to others. “ We had a great time and this cabin was great!! “ This was a nice cabin and we enjoyed ourselves. We would consider staying at Colonial Properties again! “ This place was amazing. It was more than we expected. Cabins are really close but we felt totally isolated, could not hear from any of the neighbors. It was nice and clean and I will definitely be back! “ Loved it...as always the cabin was great. We come 3 to 4 times a year and always stay with Colonial. If you stay one time you will understand. “ We will be happy to stay again with YOU. Hope to stay soon! “ We loved the view and the black bear that came by every night. Everything was wonderful!! “ It was perfect... I wouldn't change a thing. This is the second time we have stayed with Colonial Properties, and we love it. We have suggested it to our friends and family. It is truly the best weekend we have ever had. We love it and will continue to visit. “ We loved the Hanky Panky. Cozy but with enough space for everyone to get some privacy when needed. We had four adults and three children plus a baby and plenty of space. The cabin was very clean, check in and check out were quick and easy. The laundry was a great added benefit. We also loved the arcade game, the deck and the hot tub. We will definitely use Colonial again next time we visit the area. “ This is my second trip to Hanky Panky. The first trip was our family vacation and the second trip was "girls" weekend. Both trips were wonderful. Loved the cabin and surroundings. Would love to come back again next year. “ Hanky Panky is a wonderful cabin and met all of our expectations. Colonial was great to deal with and more then lived up to commitments made on their website and over the phone. 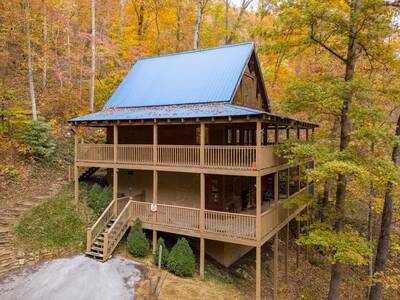 I would highly recommend this company and this cabin to anyone wanting to visit the Pigion Forge/Gatlinburg area. “ This is the best cabin I've ever stayed in and we can't wait to return! “ We loved this cabin and enjoyed our stay very much! We loved the rec room. It was very well stocked with games and things to do. This was a very quiet and beautiful area to stay in, even though there are cabins near by. “ We LOVED our stay in the Smokey Mountains!!! The view of the mountains from our cabin (Hanky Panky) was beautiful. The cabin was super clean and had everything we were looking for in a cabin. We will definitely be staying here again!! “ The cabin was everything we expected! Very clean and stocked with plenty of kitchen necessities! The upstairs loft provided endless hours of entertainment for my family! “ We've always found Colonial Properties a reliable and trustworthy company. Our latest stay at Hanky Panky has reinforced that statement. We loved the location and found the cabin to be clean and inviting with all the amenities we expected. The view from the back porch was beautiful and from the loft window even more so. We definitely would stay here again. “ We had a great time at Hanky Panky. It is a beautiful cabin. “ The cabin was very clean and beautifully decorated inside and out. The view of the mountains was magnificent! We enjoyed the on site indoor and outdoor swimming pools as well as the hot tub at our cabin. Our teenagers really enjoyed the game room with pool table and arcade game. By the end of the week we felt refreshed and made so many new family memories to cherish. Thank you! “ Everything from making the reservation, checking in and out and especially the cabin was fabulous. The cabin was well maintained, clean and very comfortable. “ We loved our stay at the Hanky Panky cabin!! 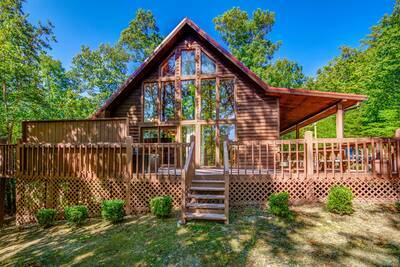 The Cabin was beautiful and clean and it's the perfect cabin for a family vacation. “ Hanky Panky provided the perfect mountain getaway.